When shopping for air filters or purifiers, you will commonly see the phrase “Remove particles as small as (number) microns”. But what is a micron and what does that mean? How does it matter when it comes to your indoor air quality? You may also wonder if there are any benefits to filtering out particles that are 1 micron versus those that are 5 microns, 10 microns, etc. How important is it and how does it affect your and your family’s health? The first thing that is important is to understand is what a micron is. As defined by Dictonary.com, a micron, also called a micrometer, is a unit of measurement that is the millionth part of a meter. One inch is equal to 25,400 microns. To put that into perspective, the average human hair is approximately 50 microns and the human eye is only able to see particles that are at least 5 microns in size. That being said, 98% of all the particles floating around in our indoor air are less than 1 micron in size. 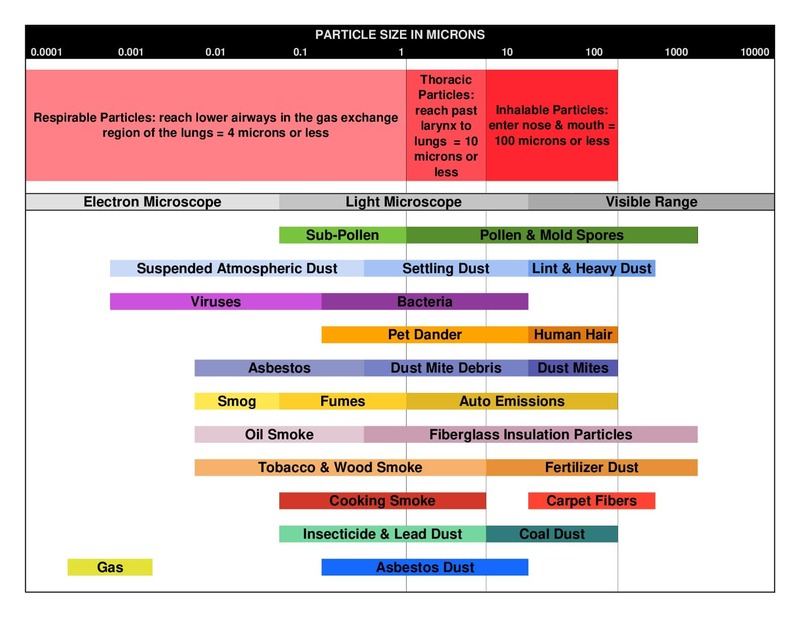 Take a look at the following chart that shows particle size in microns to help give perspective on the size of different particles. As you can see, those particles that we most want to keep out of our indoor air (viruses, asbestos, tobacco, smog, gas) are all less than 1 micron in size. Will Air Filters Capture These Small Particles? Nominal Micron Rating: This rating measures how efficient an air filter is at capturing airborne particles of a certain size, ranging from 50-98.6%. It tells you the smallest size particle that may get trapped. For instance, if you have an air filter that removes particles as small as 8 microns with a 50% nominal micron rating, then the filter will capture around 50% of airborne particulates 10 microns in size. Absolute Micron Rating: This rating gives the size of the largest particle that will pass through the filter and means that the filter is capable of removing at least 98.7% of a specific size particle. It basically tells you the filter is able to better remove particulates of the specific micron size. How Will This Affect Your Health? The American Lung Association reports that airborne particles 2.5 microns or less (called fine particles) are considered an inhalation hazard as they can be “easily inhaled deeply into the lungs where they can be absorbed into the bloodstream or remain embedded for long periods of time.” They also reported in a recent study that the mortality risk increased by 17% in areas with high concentrations of fine particles. These small particles also greatly affect you or your loved ones that have asthma problems as they can trigger asthma attacks and can cause respiratory irritation, coughing and wheezing. Now that you have all the information on microns, it makes sense that you need an air filter that can capture airborne particles that are smaller than 1 micron. But do they exist? On to the last thing you need to know about air filters: MERV ratings. MERV stands for Minimum Efficiently Reporting Value and it is this number that tells you the effectiveness of your selected air filter. MERV ratings are calculated by measuring the number of particles a filter can trap compared to the number the particles it’s trying to filter. This means that if there are two filters in the same room, the one with the lower MERV rating traps fewer particles. Basically, a filter’s MERV Rating is the numeric value assigned to it for rating and comparing the filter’s efficiency and performance. The range for standard MERV values is typically from 1 to 16, with the number indicating how well the filter removes particles from the air. The higher the MERV number, the better the filtration. There are filters available with MERV ratings higher than 16; however, they are thick and dense, and a typical residential HVAC system cannot readily handle them. In fact, they can end up interfering with the airflow by restricting it. In turn, this could end up reducing the effectiveness of your heating and cooling system and result in HVAC equipment damage. If you want an air filter with a MERV rating higher than 16, you must make sure that your HVAC system can handle them before buying and installing one. Last, but not least, and most importantly, air filters should be checked at least once a month. If they are dirty, they need to be changed with a fresh clean air filter. How do you know if your air filter is dirty? When removing the air filter from the handler, hold it up to a light source and you will be able to see if the filter is dirty or clogged – if you can’t see the light through the filter, then it’s definitely time for it to be changed. Determining the size that your system requires and choosing the MERV rating that is best for you can be a little overwhelming, especially if you have never purchased air filters for your home or if you have a new unit or home to buy filters for. You can take a look at our air filter measurement guide to help you pick the right size or call us and we can easily assist you with ordering the exact air filter size you need and recommend the best rating for you depending on the level of filtration you want. Whether you need AC or furnace filters, a specialty Whole House filter, a Grille filter, or even a custom air filter size, we have a professional and helpful staff ready to take care of you! For personal assistance with your air filter needs, please contact us now online or call us at (855) 237-1673 and we will do our very best to assist you in selecting the right filter for your individual needs. We want to earn your business and we guarantee your satisfaction! Take advantage of our quality products, vast selection, low prices, and enjoy FREE SHIPPING on every air filter order within the Contiguous USA.